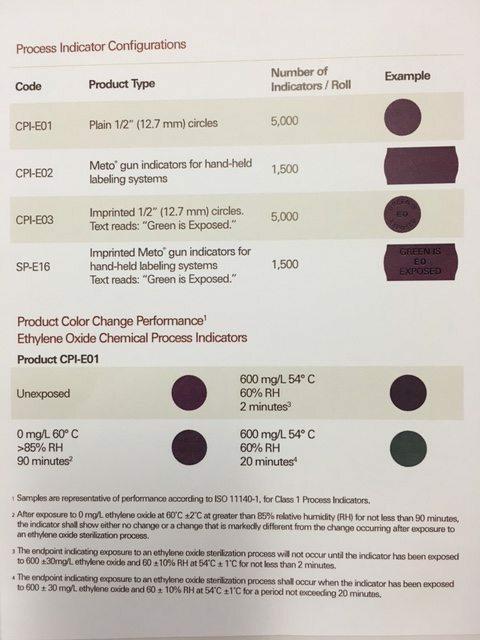 Ethylene Oxide (EO) Chemical Process Indicators (CPIs) are manufactured to meet performance specifications described in ISO 11140-1 “Sterilization of health care products – Chemical indicators – Part 1: General requirements,” for Class 1 Process Indicators. The purple-to-green colour transition is sensitive to time, temperature, humidity and presence of EO (see chart). EO CPIs are not intended for use as sterility indicators, but rather as throughput process indicators used to monitor exposure to EO sterilization processes. EO CPIs are labelled with 24 months of shelf life and room temperature storage (23 ± 7°C). The shelf life is based on the date the indicating ink is applied to the substrate. Product may have a shelf life of less than 24 months at the time of purchase. Avoid contact or storage of indicators near substrates which are acidic or basic in nature, such as cleaning solutions and disinfectants. Exposed indicators are stable and will remain green when stored under labelled conditions. Each roll is individually packaged with a certificate of conformance to ensure the products’ quality and consistency. EO CPIs are non-odorous and non-hazardous to use. The printed labels are safe to dispose in general waste receptacles. No MSDS required per CFR 1910.1200.